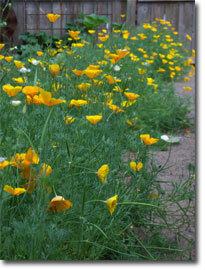 I had been toting around a few packs of California Poppy seeds for several years. Last season, I decided to throw them in as a border along my back path that flanks the vegetable garden. They were slow to get started, but wow, they took hold and a drift of them along the back path is like a little row of lights illuminating your way. They reseed pell mell (a little judicious weeding goes a long way in the spring), and they are back this season in full-force. They aren’t as pesky as morning glories when it comes to propagating their species, but I have a sense they will be around about as long as I want them to be. The mix was labeled as a blend of gold, yellow and white, but gold has emerged as the prominent bloom. California poppies are native to the southwestern U.S. and can be seen on the signs welcoming visitors to the state of California.